To thank you for your support, when you post on LinkedIn, you'll automatically be entered into our prize drawing, with a chance to win prizes including an Apple iPad, FitBit, AmEx gift cards and Apple Watch! Copy & Paste the entire description below as your LinkedIn Post. 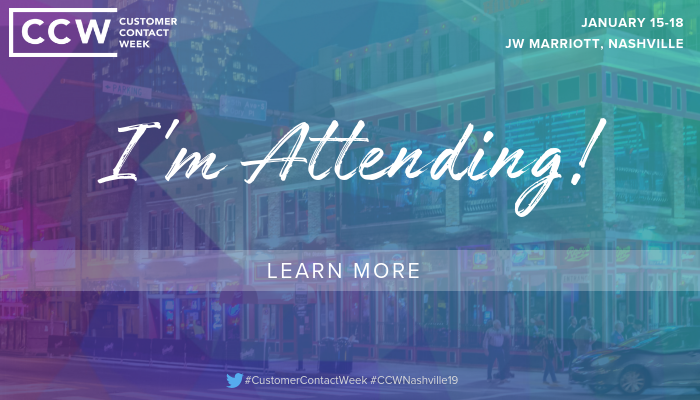 I’m attending Customer Contact Week, the world’s largest customer contact event series, this January in Nashville! In 2019, CCW is celebrating 20 years, kicking off the celebration January 15-18 at the JW Marriott. To celebrate, they’re bringing together an exciting list of experts to lead the event program including Jenn Lim, CEO & Chief Happiness Officer, Delivering Happiness; Valerie Egen, VP, Global Customer Engagement, Subway; Natalie Higgins, SVP of CX Channels & Segments, Citizens Bank and many more! Looking forward to joining 550+ CX and customer care executives and hearing from these experts! Check out more information here: https://ptdrv.linkedin.com/zkp7sji or email Giulia.Savino@iqpc.com. Right Click & Save the image below to go along with your LinkedIn post. Email Giulia.Savino@iqpc.com to confirm your posting. And most importantly, GET EXCITED FOR CCW! Right Click & Save the image below. Then, copy & paste the link http://bit.ly/2Oz7wUw to embed into the banner! If you have any questions, make sure to reach out to us by emailing Giulia.Savino@iqpc.com.